with my daughter and granddaughters. 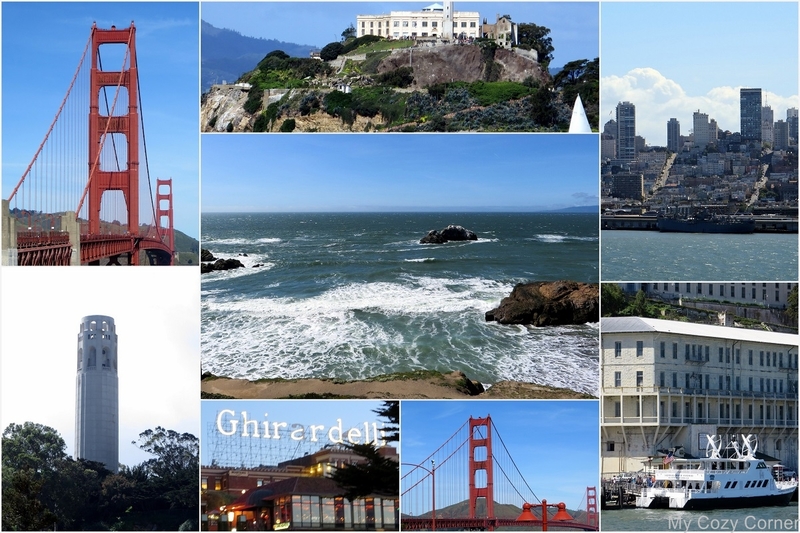 a little site seeing trip to San Francisco. Golden Gate and back again into the city. view of the bay and green hills of Marin County. for the tour bus to take us to the Ferry on wharf. BUT!! to walk to China Town. We walked to China Town looking for the other bus, but we missed that bus. THEN my daughter suggested we WALK~WHAT? And that is how our WALKING TOUR was started. it was a down hill walk. time to catch the ferry to Alcatraz Island. We toured Alcatraz Island for three hours. More walking...We walked up stairs and up hills. Another ferry was docked as we arrived at the island. The weather was amazing and the ocean was calm. I've been to San Francisco many, many times and the weather is windy and cold. and touring a very interesting U. S. National Park. A beautiful view from the Island to see the streets of San Francisco. After spending the afternoon on the Island we walked to Fisherman's Wharf on Pier 39. We did some shopping and enjoyed cracked crab with cocktail sauce on the wharf. to our Hostel. What a grand day. Yes, the girls and I stayed in a Hostel. travel and stay with other young people in a safe place. charge our phones and computers. We rode the bus across the Golden Gate and back. Stopped at the Main Gate of the Precidio U.S. National Park. We got off the bus and walked to the Walt Disney Family Museum. animator, voice actor, and film producer. We packed the car at check out time and drove all over the city. at the ocean we piled into the car to head home. I loved every minute of my trip. Thank you so much for coming along on my journey in life. Labels: Family, Oh the PLACES I've been! Sounds like you had a wonderful trip to SFO. My son lives in Las Gatos and we do get into the city. I just love all the places to see. So glad your granddaughters went on the trip also. When they get older they only want to be with their friends. My hat's off to you doing all that walking, you are a trooper. looks like you had a great time with your family! I can't believe you walked that much! I recently had the "brilliant" idea to walk to places in SF with my husband, then I realized we would be walking uphill, both ways ( as that is possible on SF!). Good for you for trekking up those hills! Great fun! Thanks for sharing at Home Sweet Home! That's a dream trip for me, we are going to try and get there in the next two summers. Everything looks so beautiful and interesting.